The nature of a country’s governance has a material impact on its prosperity. The rule of law, strong institutions and regulatory quality contribute significantly to economic growth. Effective, fair and accountable governments increase public confidence, and, ultimately, result in higher levels of life satisfaction among citizens. 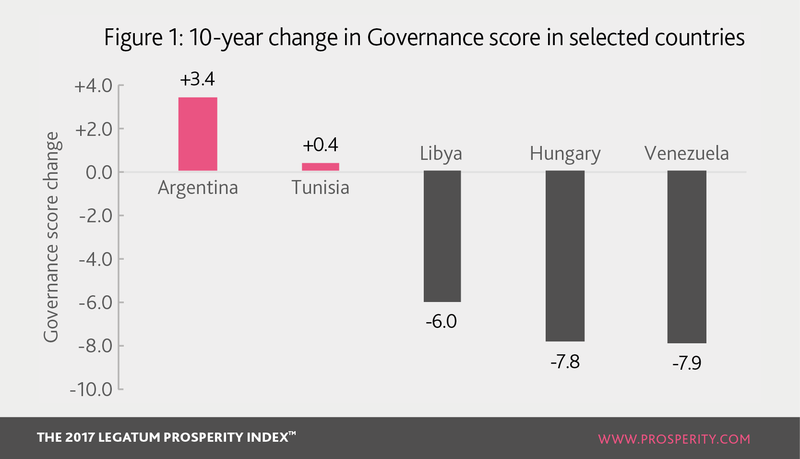 Having fallen sharply for four years, from a high in 2009, the quality of Governance around the world has now rebounded and is now at its highest level in the history of the Index. All regions of the world saw Governance improve in 2017, with Asia-Pacific rising fastest. This year’s increase was much weaker for MENA, Eastern Europe and Latin America and the Caribbean. Rule of Law assesses confidence in the rules of society: in particular this refers to the law being applied equally to all and to the quality of contract enforcement, property rights, the police and the courts. Ethiopia was the fastest riser in 2017, thanks to improvements in judicial independence. Despite improving Governance in 2017, Poland saw a fall in Rule of Law, as judicial independence fell. Latin America and the Caribbean was the only region to fall in this sub-pillar in 2017, as judicial independence and ease of challenging regulation fell. It now has the worst regional score in the world. Government Integrity measures how well government operates in a transparent and predictable manner with minimal corruption. Citizen engagement with the political process further strengthens government accountability. Sub-Saharan Africa had been in decline in this sub-pillar until this year – both corruption and government transparency improved in 2017. Although it ranks in the bottom 20 for Governance, Belarus was the best improver in the whole of Europe in 2017, as people perceived a reduction in corruption. Qatar on the other hand was the fastest faller, as the government was perceived as more corrupt than last year. Government Performance assesses the performance of the civil service, and how well regulation and policy incentivise businesses. Confidence in Guatemala’s government increased more than in any other Latin American country. Despite improving regulatory quality and government effectiveness, Iran’s government lost confidence among citizens in 2017. Greece saw the largest fall, as people’s confidence in the national government dropped sharply. Political Participation looks at whether there is active representation and participation in the political process by everyone. MENA has by some margin the lowest score in this sub-pillar, and has fallen considerably since 2012. Thailand has registered a larger five-year fall than any other nation in this sub-pillar, due to a huge decrease in democracy score and political rights. Turnout has also fallen, as has female representation in parliament.